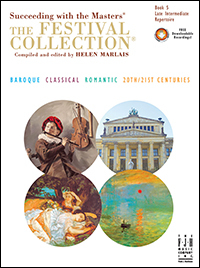 The Festival Collection® is an eight-volume series consisting of exceptional repertoire from the Baroque, Classical, Romantic, and Twentieth/Twenty-First Centuries. This series is carefully leveled from elementary through advanced repertoire, with each level covering the gamut of your repertoire needs. 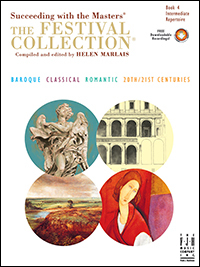 The Festival Collection® is a companion series to the Succeeding with the Masters® series, expanding upon the repertoire selections with no duplication of repertoire between the two series. Each book includes recordings of all the corresponding works to guide students in their interpretation. The Festival Collection® Preparatory is the first book available in the nine-volume Festival Collection series. To be used before The Festival Collection®, Book 1, students will have the opportunity to get their first experiences with genuine repertoire by composers such as: Couperin; J.C. Bach; Berens; Köhler; and new originals by FJH composers Timothy Brown, Mary Leaf, and more. 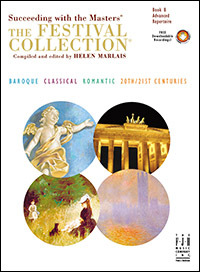 This book covers the Baroque, Classical, Romantic, and 20th/21st Centuries, with additional information about the pieces and composers as well as full performance recordings! What a terrific way to introduce young aspiring pianists to repertoire right from the beginning! Book 2 continues on the path toward the master works set forth in Book 1, providing students with continued exposure to the repertoire available at the Late Elementary level. In Book 2, the literature choices increase gradually in difficulty, adding more musical and technical challenges for careful and continued growth in the students' studies. This collection will give students the opportunity to polish their abilities in playing the repertoire that spans the Elementary level. 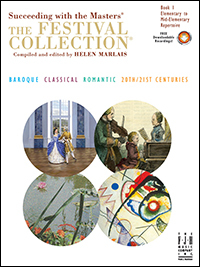 Features pieces by composers such as: Arcangelo Corelli (Sarabande); Beethoven (Russian Folksong Opus 107, No. 3); Louis Kohler (Theme and Variation from Opus 300); and Manfred Schmitz (Mister Czerny in New Orleans). Book 4 consists of pivotal Intermediate level repertoire that is essential for the student to study, and to apply the knowledge and experience they have mastered from the previous levels. The repertoire at this level will broaden the students understanding of utilizing the fundamentals of proper technique, with accurate musical expression and interpretation in their performances. Mastery of pieces at this level will allow students to refine their abilities and prepare for the advanced repertoire. 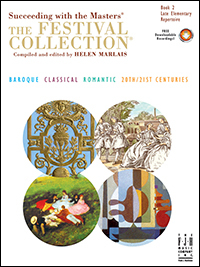 Features pieces by composers such as: François Couperin (The Little Trifle), Johann Wilhelm Hässler (Capriccio), Robert Schumann (Sicilienne, Opus 68, No. 11), and Aram Khachaturian (Ivan's Song). 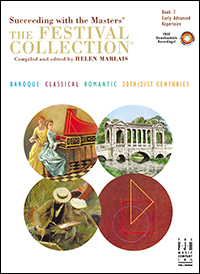 Book 6 is an exceptional late intermediate to early advanced collection of repertoire that teachers and students will find invaluable in bridging the step into advanced repertoire. The pieces are carefully edited and researched to provide the student the opportunity to apply their advancing skills to the appropriate pieces. Recording for each piece areincluded along with insightful information in "About the Pieces and Composers," which completes a well-rounded approach to repertoire at this level. The repertoire contained within The Festival Collection® Book 7 embodies some of the finest pieces from the Baroque to Contemporary eras. This repertoire was selected for its superior artistic and pedagogical merit to fulfill the musical and technical needs of the advancing pianist. 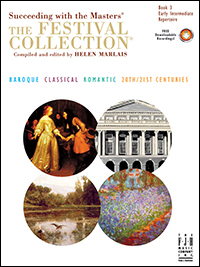 This wide selection of works is ideal for recitals, festivals, competitions, and auditions. With this collection not only is choosing repertoire with pedagogically correct leveling easier, but your students' performances will be more successful. Included are full-performance recordings with outstanding performances by renowned pianists and educators Helen Marlais, Chiu-Ling Lin, and Frances Renzi. Students are presented here with the unique opportunity to hear three different performance styles to guide them with appropriate interpretation. Also includes interesting and engaging information in the About the Pieces and Composers section. 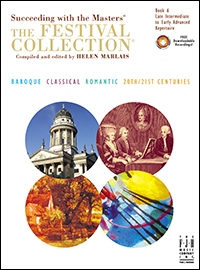 The repertoire in The Festival Collection® Book 8 was selected for its superior artistic and pedagogical merit. 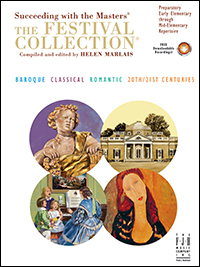 The wide selection encompasses the finest pieces from the Baroque to Contemporary eras that meet the musical and technical needs of the advancing pianist. Based on Urtext sources and original manuscripts, these compositions are ideal for recitals, festivals, competitions, and auditions. The great variety of fabulous repertoire will help make selections easier and your student's performance successful. Included are full performance recordings by Helen Marlais, Chiu-Ling Lin, and Frances Renzi. About the Pieces and Composers contains interesting program notes and background info about the composers.